program, “Juntos Por la Salud” (Together For Health) Primary Prevention Mobile Unit, offers free health screening services and travels to communities in Tucson with the help of students. From left, Camille Gonzalez, a graduate student from the UA Mel and Enid Zuckerman College of Public Health and Yvonne Mei, an undergraduate student in the nutritional sciences program at the UA College of Agriculture and Life Sciences. 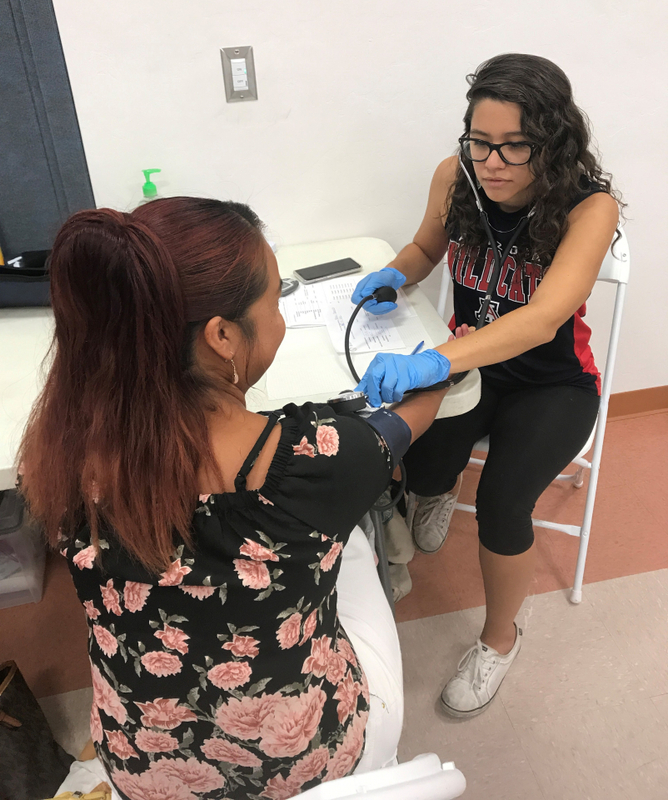 The University of Arizona Mel and Enid Zuckerman College of Public Health and the U.S.-Mexico Border Health Commission (BHC) have expanded a program that started in Phoenix to Pima County, where it is bringing health screening services to underserved residents while giving UA Health Sciences students experience working in the community. The program, “Juntos Por la Salud” (Together For Health) Primary Prevention Mobile Unit, provides free health promotion and prevention services and travels to communities where a large number of people are uninsured or underinsured. The Mexico Section of the U.S.-Mexico Border Health Commission pays for costs related to the Primary Prevention Mobile Unit, operated by the UA Zuckerman College of Public Health. 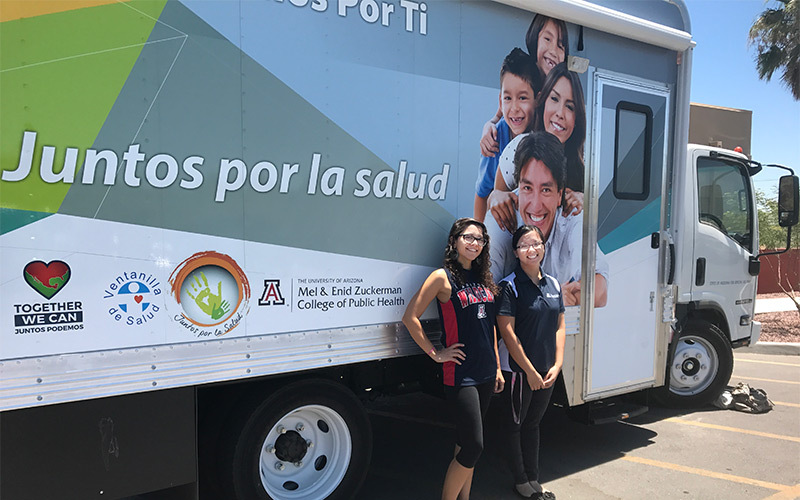 Students from the UA College of Medicine – Tucson, Zuckerman College of Public Health and the UA College of Nursing are trained to perform and deliver health-screening services to clients in the Primary Prevention Mobile Unit. The Primary Prevention Mobile Unit launched in Phoenix in April 2016 and the Tucson program followed this April. Dr. Rosales reports that the mobile unit has helped more than 2,500 residents in Maricopa and Pima counties to date. “The mobile unit is an invaluable asset and a mechanism for reaching a large population of uninsured and underinsured residents who are unaware and uninformed about services available to them. As a U.S.-Mexico border state with a high concentration of Latinos, it is important to work toward increasing access to care, health information, health education and referral services, thereby building a culture of health and healthy communities,” Dr. Rosales said. In Tucson, the mobile unit provides screenings, health education and referral services to residents. It also offers UA health sciences students the opportunity to learn firsthand. Gonzalez says volunteering for the mobile unit has taught her how to conduct basic medical screenings and to communicate the information and results to those receiving the exam. “I’m able to use my Spanish to communicate with clients. Overall, volunteering for the mobile unit has been a wonderful experience, and I look forward to continuing work with the Tucson community," Gonzalez added. Sheila Soto, MPH, coordinator for the Tucson program, agrees that volunteering is a great way to learn about the health needs of the population. “Our students are learning through interaction with community-based organizations, how to collaborate with colleagues from other professions and to understand the importance of providing culturally sensitive health services,” she added. The mobile unit focuses on screening for and prevention of six diseases and risky health behaviors, including cardiovascular disease; diabetes and obesity; tobacco; alcohol and drug abuse; cancer; and sexually transmitted infections. Mental health screening services recently have been added. The team is training staff and students on how to identify certain mental health conditions, when the mobile unit is out in the community. Thanks to a small grant from the Arizona Telemedicine Program at the UA College of Medicine – Tucson, the team is using iPads with data service and a telemedicine platform for confidentiality. The Mexico Section of the U.S.-Mexico BHC purchased the same iPads and service for Sonora, Mexico. The goal is to identify individuals with certain conditions such as depression. “We provide information and refer people to behavioral health services in Pima or Maricopa County. Before they leave the mobile unit, we connect them to a Sonoran mental health professional to explain their condition,” said Soto. The telemedicine platform allows people who come to the mobile unit to speak with a mental health professional in Sonora, Mexico, who speaks Spanish. “Mental health is such a taboo topic in Latin America, which makes it difficult for people to seek or reach for help,” said Soto. “It is a very common belief that if you have any type of mental or behavioral health problem, you are ‘crazy.’ We can bridge the gap for clients by giving them the opportunity to speak with a mental health professional in Sonora who will guide them through the condition and help reinforce that is ok and there is help available,” said Soto. This connection helps to ensure that clients will follow up with professionals in Arizona, added Soto. Luis Romero believes the mobile unit gives students pursuing a career in health professions a unique and profound experience. As a pre-med student studying physiology with a minor in Mexican American Studies, he likes the one-on-one patient interaction. “This is something that is important as a future health-care provider. The people I have interacted with are always very grateful and I enjoy talking to them. No two days are ever the same, and because of the nature of the mobile clinic, I’ve learned how to perform basic health screenings and educate the community about implementing healthier lifestyle choices. Juntos Por la Salud solidified my decision to pursue a career in medicine and my desire to work with underserved communities," said Romero. Dr. Rosales hopes they can reach residents who otherwise would be unlikely to seek medical help in a setting such as a doctor’s office or hospital, and help them find a community health center through referrals. “The most rewarding part of this project is reaching out to community residents who have limited information and access to public health and health-care services, identifying available services that are within close proximity to their residence and helping to connect them to a medical home,” Soto said. UA health sciences students who want to join the Primary Prevention Mobile Unit Program as a volunteer may contact Sheila Soto at ssoto2@email.arizona.edu. The UA Health Sciences’ commitment to improve the health of Arizona and prepare students to deliver compassionate, community-responsive, patient-centered care also includes the UA College of Medicine –Tucson’s Mobile Health Program. Operated by the UA Department of Family and Community Medicine since 1976, the Mobile Health Program was started by UA family physician Augusto Ortiz, MD, and his wife, Martha, to serve the health-care needs of uninsured families and individuals in Southern Arizona. The program’s payment policy remains, “pay if you can, and if you can’t, you still will get care.” Since its beginnings, the Mobile Health Program has received financial support from many partners, including the UA, Banner Health, Pima County, non-government organizations and private donors.